"The Rock Hall Three For All". 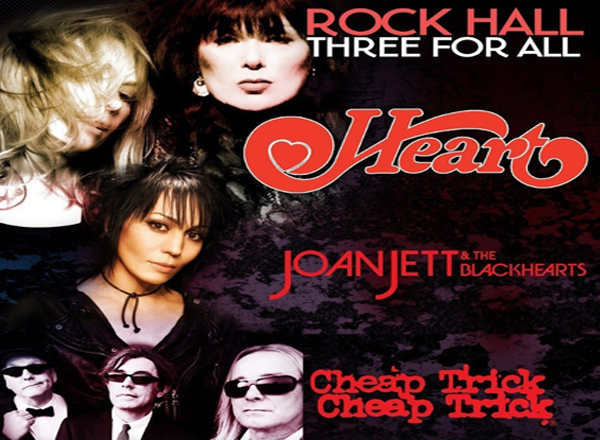 Heart, Joan Jett and The Blackhearts & Cheap Trick –three rock n' roll hall of famers in one hall, for one concert night is definitely larger than life. This is one of the most explosive rock combinations ever assembled in rock history. All classic rock roads will lead to this side of town as these three iconic bands will make you scream 'I Love Rock n' Roll!'. 'The Flame' of rock is burning bright with anticipation and will burst into a sonic explosion as these legends hit the stage. You are not 'Alone' in this. Legions of fans combined are rockin' and reelin' with utmost anticipation. Secure your tickets as early as you can, this is gonna be wild! Ann and Nancy Wilson, collectively known as Heart, showed the world that women can rock harder than ever, with their signature raspy and mega-powerful vocals. In history, they are noted as one of the first women to play the electric guitar. They stormed the 70s with their gritty chart-toppers "Crazy on You," "Magic Man," "Barracuda," "Straight On". Their power streak continued to electrify the charts with hits like "These Dreams," "Alone," "What About Love," "If Looks Could Kill," "Never," "All I Wanna Do is Make Love To You", and many more. As the band raked-in over 35 million albums, they also performed around the world in sold out stadiums. To date, Heart are still at the top of their game performing for their loyal fan base and engaging new generations of followers everywhere. As Joan Jett pursued her solo-headliner act as frontwoman of'Joan Jett and The Blackhearts', she became the symbol of women who assert themselves through vision and innovation. "I Love Rock 'N' Roll," became the anthem of an age and a generation. With eight platinum and gold albums and nine Top 40 singles to her name, the band Joan Jett and The Blackhearts, was inducted to the Rock & Roll Hall of Fame, and has acted in movies, television, including the Tony-nominated Broadway musical, "The Rocky Horror Show." Cheap Trick's 50-year old career is clearly deserving of the citation- 'one of the most influential classic rock groups of all time'. They have a jaw-dropping resume that includes over 5,000 performances nd 20 million records sold worldwide. Cheap Trick is noted for their anthemic classics like "I Want You To Want Me", "Surrender", "The Flame", "Dream Police", and many more.